Think Pilates is boring, slow and similar to yoga? Or do you think it's just for women? This misconception may have arisen after seeing a workout video in a gym or a demo from a DVD, says Sheetal J Shah. If you have been following celebrity accounts for fitness tips, you have a fair idea of Pilates. The exercise regime is increasingly popular among athletes, models, actors and homemakers. This popularity has also led to some obscure myths making some people hesitant to give it a try. Not many people know that Pilates was founded by and named after Joseph Pilates, a German American physical trainer with the aim of helping rehabilitate bedridden soldiers during the World War. The early program he designed was called contrology. It focused on core control, balance, strength, stamina and overall mind-body control. 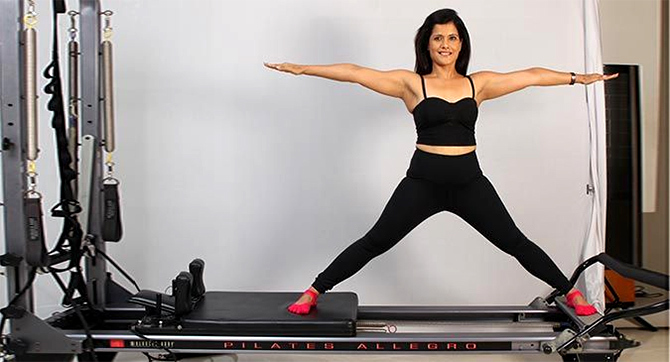 Today, Pilates is popular among male athletes like golfer Tiger Woods, tennis player Andy Murray, baseball player Jake Arietta who use it as a complementary work out along with weight training and cardio exercises. While it is partly true that Pilates has been designed to place an emphasis on your core, especially your deeper abdominal muscles. However, building up your core goes beyond just giving you a flatter looking tummy. By strengthening your abdominal and pelvic floor muscles, you are boosting your overall strength, stability and freedom of muscles. This form of workout actually promotes stability, mobility, strength and flexibility in both intrinsic (deeper) and extrinsic (superficial) muscles of the entire body. It works on four basic areas of movement -- flexion, extension, lateral flexion and rotation. The exercise regime is grounded in several key principles of breathing, concentration, control, centring, precision, balanced muscle development, rhythm, whole body movement and relaxation. These prime your body for daily activities such as lifting, pushing, turning and reaching. Quite a few friends and clients have told me that they find Pilates to be boring and way too easy. This misconception may have arisen after seeing a workout video in a gym or a demo from a DVD. For the less informed, Pilates is designed to target the smaller but stabilising muscles. If your body is not positioned accurately, your body will naturally use bigger muscles. Since these muscles are much stronger they may make you feel like you are not working very hard. Also, the workouts vary according to different levels of difficulty and the person doing it. Depending on the intensity of the workout the speed will also vary. The control and alignment of an exercise can often be lost if the movements are performed at a fast pace. Often slowing down the movements will intensify the exercise and you will be able to pinpoint specific muscles especially the smaller and deeper ones. Once you perfect the exercise, you may increase the speed to further challenge your body. Some types of Pilates workout require the use of special machines. The Reformer, Cadillac and the Wunda chair are some of the popular ones. These machines can amplify your workout but they are not completely necessary. In fact there are several exercises that can be done on a yoga mat. All the basic movement principles of Pilates can be incorporated into a mat workout. Pilates and yoga may seem similar because of the flexibility and stretching methods. They are actually very different. For example, the breathing and concentration techniques used in Pilates and yoga are not the same. In yoga, you’ll need to breathe in and out through your nose. In Pilates, you inhale through the nose and exhale through the mouth. Pilates classes offers a complete body workout with a focus on aligning your spine and strengthening your core. In yoga, the weight of the body is used as a resistance for exercise. The movements are more like poses that are designed for different needs and purposes. While both yoga and Pilates increase flexibility of the body, Pilates is more dynamic in nature. Both workouts may have several poses that are suitable for toning the abdominal muscles. However, Pilates exercises are a bit more intense and results are achieved more quickly. Pilates includes the use of resistance machines in addition to mat exercises which combines the benefits of weight training and yoga.